The Set-Up: The oldest of Willie’s kids, John Luke and Sadie, get their wisdom teeth removed. Jase and Jep have to clean rotting meat out of a broken freezer. Hilarity Ensues: Phil comes over to the warehouse and finds Jase and Jep gagging over the rancid deer parts, ducks, and shrimp they’ve pulled out of the freezer. Phil has a job for them, which seems to involve killing dangerous Cottonmouths. But first they have to find a way to get rid of the meat. This involves Phil driving the boys from place to place in his pickup while they argue about where they can get away with disposing of bags of garbage that smell like a rotting corpse. Meanwhile, John Luke is recovering form the surgery, which his parents have watched. Willie, the fearsome hunter, is nearly felled by the sight of human blood. When John Luke wakes form the surgery, he goes into an extended half-anesthetized schtick of mumbling, singing, and making rude comments to everyone within earshot. Major Theme: A father’s work is never done, whether the kids are teenagers or adults. 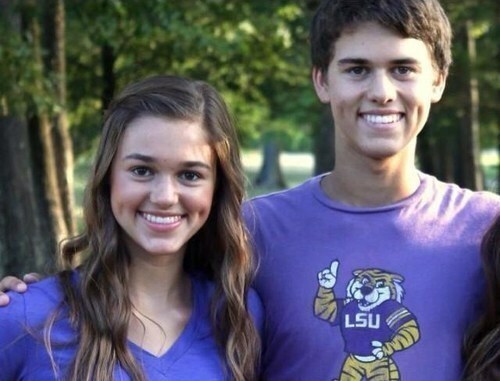 Sadie and John Luke Robertson. Wouldn’t it be great if all your awkward teenage moments were captured on camera? Is This for Real? : Somehow, I can’t really see Miss Kay singing “My milkshake brings all the boys to the yard” while she’s making milkshakes for the kids who’ve had their teeth removed. But whichever of the show’s producers thought if it, it was a cute touch. The Christian Angle: One of the funnier scenes is when the Jep suggests dumping the meat in the church dumpster. Phil’s calculation is biblical: 1 Corinthians 10:25: “Eat anything sold at the meat market without questions of conscience.” This is a rule that was meant to give early Christians the freedom to eat whatever meat was available, even if it was sacrificed to other gods. After all, why worry about food sacrificed to gods that don’t exist anyway? Jase gets cold feet—not the least because of the church’s security cameras—and they drive off with a truck bed still full of rotten meat roasting in the Louisiana sun. After an attempt to offload it at the dumpster of a Mexican restaurant, they decide to call their oldest brother Alan, who is a pastor, for advice. Alan informs Jase, “You’ll probably have more to answer for come Judgment Day than dumping stuff at the church.” So the meat gets dumped at the church, with Phil, Alan, and Jep’s approval. The Wrap-Up: Duck Dynasty will be taking a break next week, but I shall blog on. I’m formulating a response to Phil’s sermon that has been making the rounds on YouTube, and will try to have it for you next Wednesday.